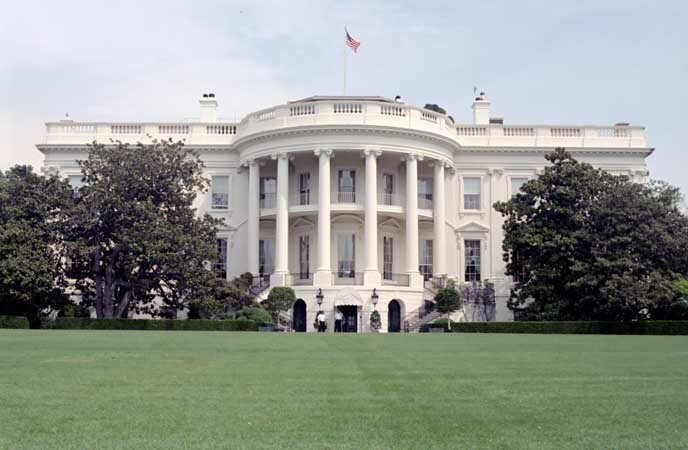 The White House submitted an outline of its budget request for FY 2018 and its supplemental budget request for FY 2017 this week. The FY 2018 request would require some countries receiving U.S. Foreign Military Financing grants to pay the U.S. government back and would reduce the amount the United States pays for UN peacekeeping. The FY 2017 request includes additional funding for and modifications to the new U.S. authority to train and equip certain foreign forces fighting ISIS. In an article arguing that budget cuts should come from military aid instead of domestic programs, SAM’s data is used to show the cost and scale of the Pentagon’s arms and training programs. This article examines the Trump administration's plans to terminate U.S. subsidies for foreign allies to buy American-made weapons outright and replace them with a loans program. This article discusses the Trump Administration's efforts to send a much larger U.S. arms sale package to Taiwan than the Obama Administration wanted to help the country defend against China. This article discusses changes to the Defense Security Cooperation Agency under the 2016 NDAA, and the agency’s efforts to streamline the Foreign Military Sales process. The article discusses concerns from African military leaders that badly needed U.S. security assistance comes at an uncertain time for U.S. policy and military involvement abroad. The article states that Trump’s resumption of an F-16 sale to Bahrain allows for human rights conditions to deteriorate as the leadership in Bahrain launch a new crackdown on opponents. This opinion piece looks at the history of U.S. arms sales to Saudi Arabia to show that Obama’s decision to sell arms to the Saudis was not outside the norms of U.S. policy. This eBook analyzes various aspects of the Foreign Military Sales program and the ways it has changed under the Obama administration. This report summarizes the complementary methods used to develop the toolkit, including a review of CVE programs, to identify data collection practices and challenges to evaluation. This report reviews Qatar’s political and economic situation, focusing on many aspects of the it’s relationship with the U.S. including security aid and cooperation. The top 5 Foreign Military Financing recipients in FY2017 are Israel ($3.1B), Egypt ($1.3B), Jordan ($350M), Pakistan ($265M), and Iraq ($150M). 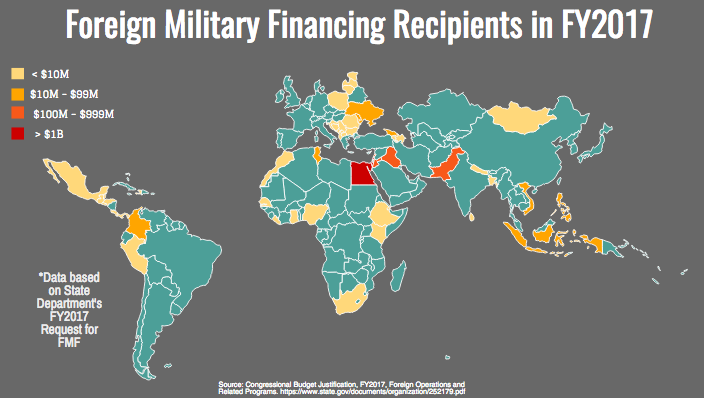 See our FMF Fact Sheet for an interactive infographic of the map and our military aid database for more details. The estimated cost is $66 million. This memo updates the Security Assistance Management Manual with procedures for requests of information on defense articles/services/trainings managed by the US Special Operation Command. It also defines roles and responsibilities. H.R.1619 - To authorize assistance and training to increase maritime security and domain awareness of foreign countries bordering the Persian Gulf, the Arabian Sea, or the Mediterranean Sea in order to deter and counter illicit smuggling and related maritime activity by Iran, including illicit Iranian weapons shipments. During the meeting the President and Deputy Crown Prince discussed ongoing security and military cooperation between the two countries in confronting Daesh/ISIS. Comments and suggestions from the public and affected agencies concerning the proposed collection of information are encouraged and will be accepted until May 15, 2017.